A lung biopsy involves removing a small piece of lung tissue in order to look at it under a microscope. The sample taken from the lungs is important in helping your doctor diagnose a disease. Why is a lung biopsy done? A biopsy is a sample taken to help diagnose a suspected lung cancer. If there is reason to believe that there is lung cancer, the doctor will perform a biopsy to confirm any suspicion. A biopsy is also done to diagnose other conditions, such as: pulmonary fibrosis or sarcoidosis. Even if previous tests like X-rays and CT scans cannot identify the problem, a biopsy can be performed to confirm a diagnosis. There are several methods used to take samples of lung tissue. A long needle is used take a sample of lung tissue through the chest wall. Based on other tests like chest X-Rays and CT scans, this method is mainly used for abnormal lung masses found closer to the inside of the chest wall. This is a simple outpatient procedure, mainly performed by a radiologist. Risks of a needle biopsy include causing a collapsed lung (pneumothorax), or risk getting little to no tissue samples during biopsy. This minimally invasive procedure uses a camera-mounted scope and a series of small incisions made in the chest wall to surgically remove a piece of lung tissue. Some liken this approach to using “chopsticks” to surgically remove a sample. An open biopsy requires a larger cut in between ribs of the chest, in order to remove a tissue sample. This type of biopsy is done when all other methods and attempts have either been insufficient, not successful, or when a larger tissue sample is needed for proper diagnosis. A bronchoscope is a long flexible instrument that has a camera mounted on the end. It is inserted into the nose or mouth in order to gain access to the airway. A bronchoscopy does not require making any incisions, but allows the doctor to see the physical condition of the lungs, as well remove small samples of tissue and lymph node fluid for testing. 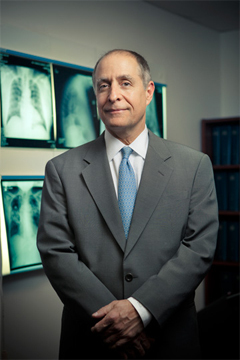 A lung biopsy is generally a safe and quick procedure. However, as different methods are invasive, which require making incisions and applying anesthesia, there are still some associated risks of biopsy.